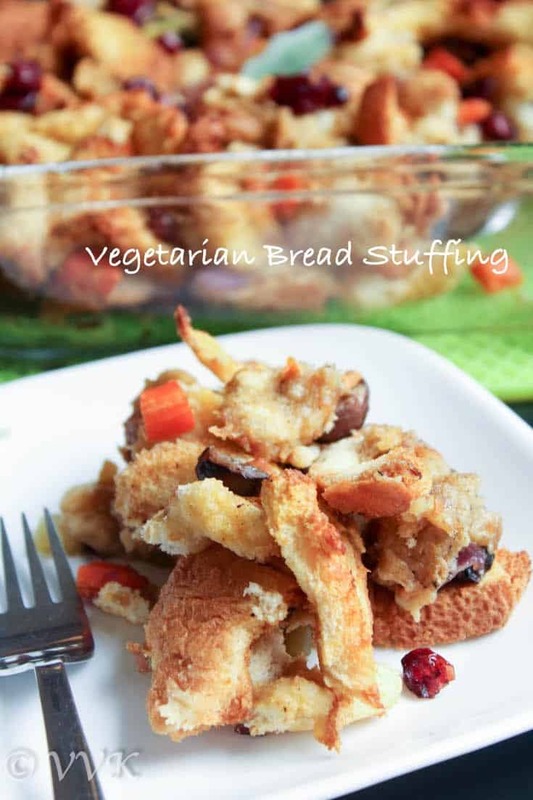 The next thanksgiving vegetarian recipe is the bread stuffing or the thanksgiving stuffing. 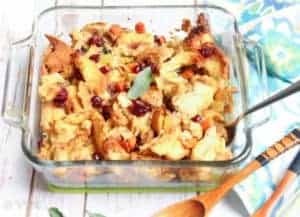 As the name suggests, it’s the filling that goes inside the turkey and hence the name thanksgiving stuffing. But I am going to present it as a thanksgiving side. (err main dish for vegetarians). 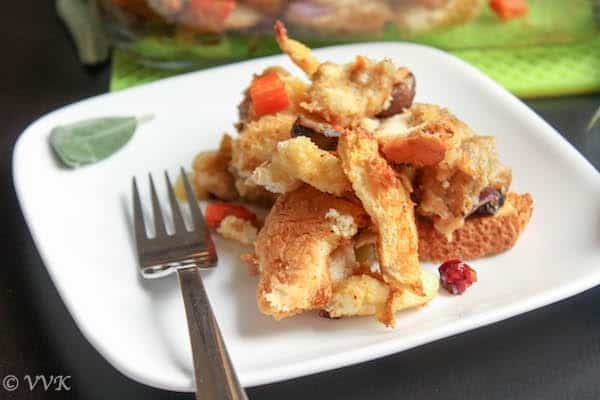 This stuffing is usually prepared with dry bread or croutons or with left over baguette along with veggies. 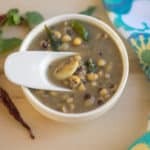 The main herb that is used in this recipe is the sage. Before getting into the recipe, let me share few information about sage. As I mentioned in my previous post, herbs play a major role in the thanksgiving dinner. Rosemary, thyme, oregano and sage are the most widely used herbs in the thanksgiving recipes. Sage is called as the sister herb of rosemary. It’s a perennial shrub too and its soft velvet leaves are used in cooking. The soft texture is because of the fine hair that covers the leaf. 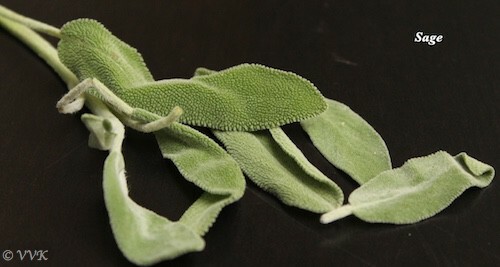 Sage has a sweet and savory flavor. Here is the closer look of the sage leaves. 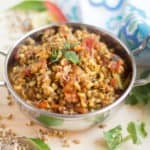 So now back to the recipe, this recipe is more like bread upma. :-) I used buttermilk bread for this recipe along with vegetables like carrots, mushrooms and celery and I kept the bread pieces, when the oven was pre-heating to get the dried bread effect. Basically you cook the veggies and add it to the bread and bake it until crisp. 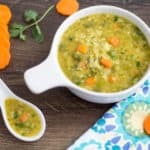 The moisture is retained with the help of vegetable broth. Now that sounds more like upma right? Err may the baked version of upma. Vaandu enjoys this a lot and this is a perfect afterschool tiffin. Pre-heat the oven to 350 degree F. You can keep the teared bread pieces in the oven in a baking tray when it is getting pre-heated. This step is optional. Once the oil is hot, add the chopped onion and garlic. 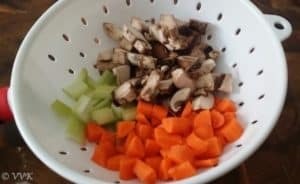 Saute for couple of minutes and then add the carrots, celery and mushroom. Mix them well and add the salt and pepper. Let it cook for two minutes. Now add the chopped sage and 3/4 cup of vegetable broth and let it simmer for 5 minutes and turn off the heat. 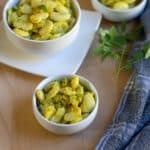 Grease a casserole dish and add this cooked vegetable mix. 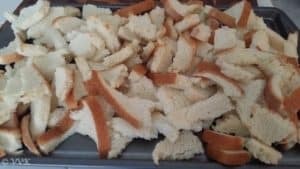 Now add the bread pieces and mix well. Add 1/4 more cup of vegetable broth. Bake this for about 20 minutes. Remove it from the oven and add 1/4 more cup of vegetable broth and bake again for 25 minutes. Garnish this with dried cranberries and serve hot. You can add any vegetables of you choice. Apples and pears can be included along with dry fruits. Sage is usually used in the bread stuffing, but you can replace it with the herbs that you have in hand. I used butter milk bread, any sour dough bread or baguette can be used. Adjust salt and pepper as per your preference. You can bake this by covering it for first 20 minutes and then bake again uncovered. 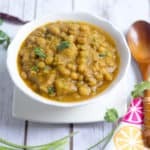 Instead of store-bought vegetable broth, home-made can be used. 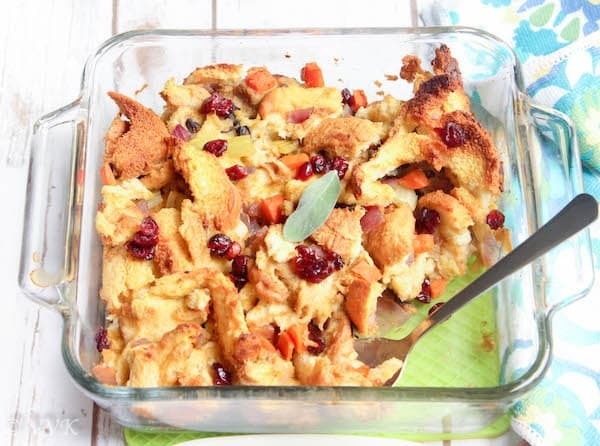 The vegetarian version of the thanksgiving stuffing prepared with bread and vegetables. 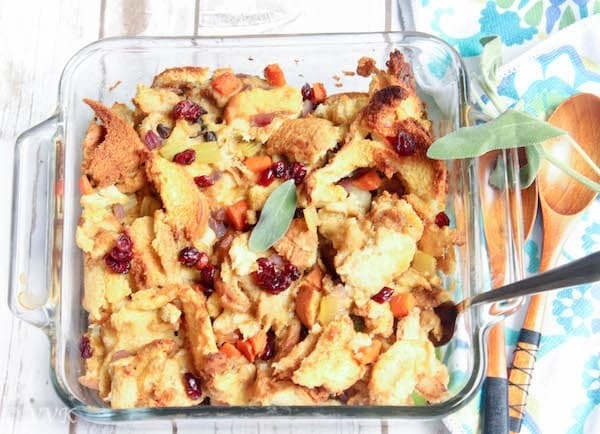 Bread stuffing looks yummy…Happy Thanksgiving dear!! 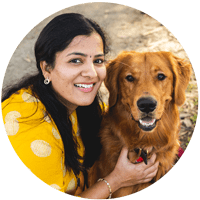 Thanks a lot Padma and hope you had great break. 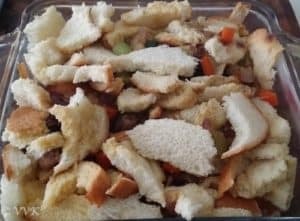 This bread stuffing looks really delicious and filling breakfast..Happy Holidays dear !! Thanks Jolly and same to you too.